I won't lie and say I have a lot of experience in actually participating in Twitter chats (although I'm trying to change that), but will I say that I do have a lot of experience in understanding how one functions. I have an internship at cool company called Collective Bias. One of the many things they do is host weekly Twitter parties (similar to a Twitter chat) as part of a client's campaign. There are parties each and every week and I've been privelaged enough to see the inner workings of a Twitter party first hand. I've also seen how awesome the engagement is during Twitter parties/chats. So many quality people tend to chime in and provide invaluable insight into whatever topic or product discussion is at hand. Participating in a Twitter chat is a great way to boost your following, pick up some tips, and to interact with others in your field (or the field you hope to be in). If you're looking to grow your tribe, connecting with others via a Twitter chat is a great way to get the ball rolling. If you've never participated in a Twitter chat it can be hard to know where to start. The biggest question I personally had was, "Which chats do I join and when are they happening?" I did a bit of research myself, scoping social media and checking out the Twitter chats some of my favorite bloggers participated in themselves. 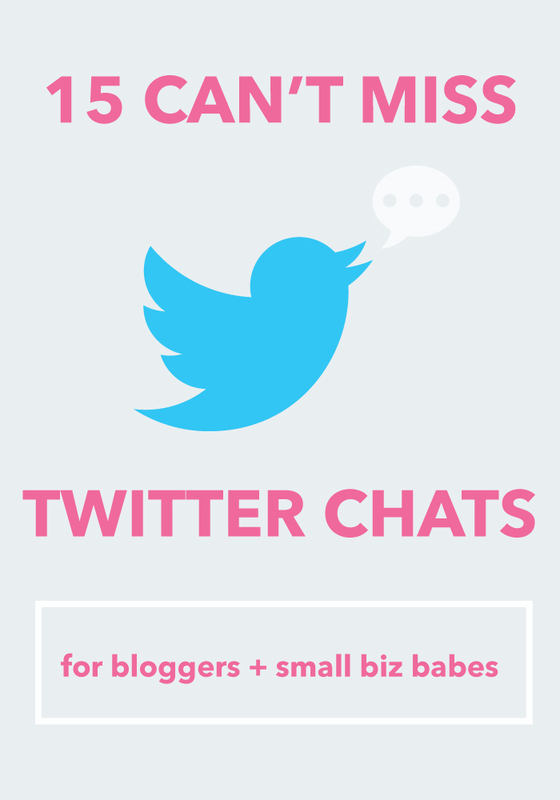 After that, I feel like I've curated a small, but great, list of Twitter chats perfect for the badass blogger or small biz babe. I'm new to Twitter chat-dom, but I have a feeling this list will quickly become 15 of my favorite, can't miss weekly Twitter chats! #bufferchat - Depends, keep an eye out! Hope you enjoyed this little round up! I'm hoping to start joining a lot of these on a regular basis. If you have a favorite chat please let me know what it in the comments below. I'd love to know! P.P.S Are you following me on Twitter? Hey! I stopped by from the link party in the HCBN Facebook group. Love this list :) I adore anything Melyssa at The Nectar Collective does and have been meaning to join in on her Twitter chats, I'm just usually at work when they happen! I think I'm going to try to get in on the #ellechat today :) Thanks for sharing, these are definitely valuable tools. I just participate in the #lbloggers chats. I feel like there are so many to keep up with. I would like to join them eventually, but I don't think I'd ever be able to join in them all. It is nice to know what's available though. I know what you mean! I'm thinking about joining 3 a week and seeing which ones I like best. I'll have to check out #lbbloggers! Love Melyssa! Her blog is amazing and I've heard nothing but great things about her #nectarchat. It's one of the ones I'm most eager to give a try! Ashlee I just discovered your blog, and I have to say I think it's adorable! So glad I found it, and I always love being able to follow along someone's blog + adventures + story! :) I believe I'll be checking this site alot - lol.